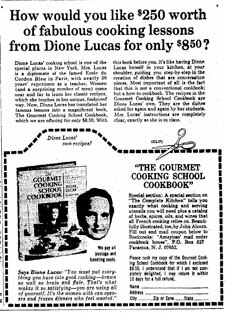 Dione Lucas (née Wilson, 10 October 1909 – 18 December 1971) was a food writer, teacher and a Cordon Bleu graduate. She was born at the British Consulate in Venice, Italy and raised in France. She had a sister named Orea. Her father Henry Wilson was a sculptor, architect and painter. He also made jewellery. She became the first woman ever to graduate from Le Cordon Bleu in Paris, earning the “Grand Diplome.” After her diploma, she apprenticed at the Drouant Restaurant in Paris. In 1930, at the age of 21, she married Colin Lucas (1906 – 1984), an up and coming British architect. In 1933, Lucas became associated with the architectural partnership of Connell Ward & Lucas. In the same year, Dione, in partnership with Rosemary Hume, set up a Le Cordon Bleu branch school in a one-room facility in Chelsea, London. They both had to take additional Cordon Bleu courses to be allowed grant diplomas. Click for larger]By 1935, they had moved the school to larger premises at 29 Sloane Street London, where they set up an adjoining small restaurant staffed by students from the school. Rosemary ran the restaurant, Dione did the teaching. Colin designed the restaurant for them in modernist style. The restaurant was successful. In 1937/38 she opened another restaurant called “Au Petit Potager” at 142 Wigmore Street, also designed by Colin. In 1939, World War II began. Dione & Rosemary closed their Cordon Blue school in London for the duration of the war. It would not re-open until 1945, with Constance Spry buying out Dione and becoming one of the co-owners with Rosemary. At the start of the war, Colin was working at the British Research Station at Princes Risborough on ways to reinforce concrete for defences. They had a son, Mark, who was seven, and Dione was pregnant with their next son, Peter. Dione left for Canada with Mark and her copper pots in tow — as well as three boys belonging to an Ursula Walford. She arrived in Ottawa to stay with Colin’s aunt and uncle there, Sir Gerald and Margaret Campbell. Gerald Campbell was Britain’s High Commissioner to Canada from 1938 to January 1941. Colin stayed behind in England to help with the war effort. The British Government transferred the Campbells down to Washington in January of 1941. In any event, she was in Manhattan by 1942. Her first job there was at the Longchamps Restaurant on Madison Avenue, fluting mushrooms 8 hours a day. Then she went to work at the Hope Williams Ranch near Cody, Wyoming. In 1942, she opened the Le Petit Cordon Bleu cooking school and restaurant in New York, with herself as the Director, at 117 East 60th St., New York. From the opening of the school until the end of the war, owing to the occupation of Paris she was the only person in the world granting Cordon Bleu certification during that time period. At the end of the war, Colin came to Manhattan to meet up with his family. He did some architectural consulting work for the British Council there. Dione’s career in America was taking off, but Colin didn’t see many possibilities for him. At the end of the 1940s, the couple separated and he moved back to England, where he became a successful architect working for London County Council in rebuilding London. Though her first show ended after a year, her restaurant and school continued to be a success. At her Cordon Bleu restaurant in New York, in 1950 she would make up to 200 omelets at noon hour. You could choose from 16 on the menu. Her second TV show started in 1953. 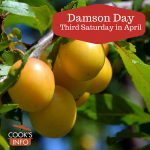 Produced through Manhattan channel WPIX, it was a 1/2 hour long programme called “The Dione Lucas Cooking Show.” It was syndicated out to close to 60 other cities. Many channels ran it as a morning or afternoon show. One of the sponsors was Caloric Ranges. She endorsed them in ads, and they even released a model named after her, which she used on her TV show. Sponsors varied by channel & state — on WFBM, Indiana, it was the Indiana Gas and Water company. In 1955, she gave a cooking demonstration on June 19th at Bennington College in Bennington, Vermont. In the mid-1950s, she went to Australia during the summers and appeared on TV programs there. In 1956, Dione opened a restaurant called the “Egg Basket” for Bloomingdale’s in New York on East Fifty-Seventh Street. By 1960, she was endorsing products for other companies such as Standard Brands. “One interesting meeting [Ed: in Chicago] was that of Standard Brands when they presented a “Seminar in Advanced Cookery.” The classroom was the Four Georges Room at the Ambassador West Hotel and the instructor was Dione Lucas, famed authority who has a well-deserved reputation as one of the outstanding teachers of fine cookery today. From a kitchen setting with white brick walls, copper appliances and accent touches of bright emerald green, Mrs. Lucas presented a number of delectable dishes utilizing Standard Brands products. With Chase and Sanborn Coffee, she prepared a famous coffee drink known as Vienese [Ed: sic] Coffee Franz Josef and an Austrian Veal Roast that owes its goodness to a coffee-flavored sauce. In the 1960s, she adding writing for the Australian Women’s Weekly to her list of chores. By 1964, she was working at a New York restaurant called “The Gingerman” at 51 W. 64th St, opened by the actor Patrick O’Neal and his wife Cynthia Baxter, and his brother Michael. Patrick was at the time acting in a play based on the book “The Gingerman” by J.P. Donleavy. In late 1963 / early 1964, Patrick and Michael were waiting for their liquor licence to be approved before they opened. During that time, Michael decided to take a cooking course at Dione Lucas’s cooking school. Lucas expressed interest in becoming the chef for his new restaurant, and they agreed. At the restaurant, there was a window into the kitchen so that customers could watch her at work. 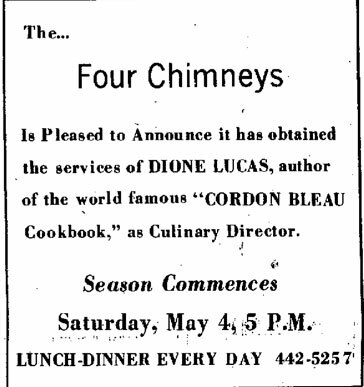 Dione Lucas Four Chimney’s]In April of 1968, she moved back up to Bennington, Vermont, as seen in this advertisement from the Bennington Banner. Bennington, Vermont. 2 May 1968. Page 6. In September 1968, she switched to working for a restaurant called the Potters Yard Brasserie, also in Bennington, working for David and Gloria Gil. After that at some point, classes were held at East 59th Street, and then under the name of the Gourmet Cooking School, at East 60th Street. Her last residence in New York was at 200 East 51st Street. Her sister had moved to Ticino, Switzerland by then. A scholarship fund, the “Dione Lucas Scholarship Fund” was set up in her memory at the Culinary Institute of America in New Haven, Connecticut. It is not known if the fund is still extant. At her death, her papers were willed to Marion Gorman, who placed them with the Arthur and Elizabeth Schlesinger Library at the Radcliffe Institute for Advanced Study, Harvard University. At some point, she worked for the Heritage Village Restaurant in Southbury, Connecticut. 1936. Au Petit Cordon Bleu: an array of recipes from the ‘École du Petit cordon bleu,’ 29 Sloane Street, London. With Rosemary Hume. 1944. The Cordon Bleu Cook Book. Little, Brown and Company, Boston. Dedicated to Rosemary Hume. 1955. The Dione Lucas Meat and Poultry Cook Book Boston, MA: Little Brown (with Anne Roe Robbins.) 324 pages. Illustrated. 1960. Good Cooking. Sydney: Australian Consolidated Press. 64 pages. Illustrated. 1964. The Gourmet Cooking School Cookbook. New York: Bernard Geis Associates. “Undisputed monarch of gourmet cooking in America…” — Cannon, Poppy. Lucas Omelet Souffle. Alton Evening Telegraph. 14 January 1965. Page 22. “Dione Lucas has long been the high priestess of haute cuisine in New York…” — Claiborne, Craig. Take Pride in Cuisine. New York Times News Service. Appearing in: San Antonio Express and News. san Antonio, Texas. 21 January 1965. Page 58. “It’s best to cook a strudel when you feel mean. The beast stands or falls on how hard you beat it. If you beat the dough 99 times, you will have a fair strudel. If you beat it 100 times, you will have a good strudel. But if you beat it 101 times, you will have a superb strudel.” — Dione Lucas. [1a] “The book (ed: The first edition of The Cordon Bleu Cook Book ) was dedicated to Rosemary Hume who also attended Cordon Bleu, and passed the exams, with Mrs. Lucas….More research is needed but I believe they were both at the school” — Chris Antony in correspondence with Cooksinfo.com. October 2013, on file at Cooksinfo.com. [1b] Scribner, David. Cordon Bleu Chef Dione Lucas Opens ‘Brasserie’ Restaurant. Bennington, Vermont: Bennington Banner. 8 November 1968. Page 14. Dugas, Gaile. Blue Ribbon Cook Says Good Food Takes Time and Effort. Lima, Ohio: The Lima News. 28 March 1950. Page 13. Lake, Talbot. Serve Vegetables, Soups To Conserve Says Expert. Huntingdon, Pennsylvania: Daily News. 9 March 1943. Page 8. Sheila Hibben, Markets and Menus. The New Yorker, 3 February 1945, p. 63. Clark, Rocky. Listening Post column. Bridgeport, Connecticut: The Bridgeport Telegram. 11 July 1948. Page 29. Crosby, John. Cooking in Front of a TV Camera. Portsmouth, Ohio: Portsmouth Times. 1 August 1949. page 20. Neuhas, Jessamyn. Manly meals and mom’s home cooking: cookbooks and gender in modern America. JHU Press. 2003. Page 183. Eanes, Ryan Scott. From Stovetop to Screen: A Cultural History of Food Television. Thesis for the Master of Arts in Media Studies. The New School. 2008. Page 12. Rallis, Nancy, Stephen Rallis and Diane Conover. A tribute to Jimmy Rallis. Letter to the Editor. Bennington Banner. 11 May 2005. Lewellyn, Hattie. They’re Cooking With Coffee. San Antonio, Texas: San Antonio Express. 1 October 1960. Scribner, David. Cordon Bleu Chef Dione Lucas Opens ‘Brasserie’ Restaurant. Bennington, Vermont: Bennington Banner. 8 November 1968. Page 14. Bennington Banner. 21 December 1968. Page 51. Clay, George R. Tribute to Mrs Lucas. Letter to the Editor. Bennington, Vermont: Bennington Banner. 24 December 1971. Page 4. Heimer, Mel. My New Nork. Naugatuck, Connecticut: Naugatuck Daily News. 11 May 1970. Page 10. Claiborne, Craig. New York Times. 23 September 1969. Rockwood, Agnes. Just Pokin’ Around. Bennington, Vermont: Bennington Banner. 6 March 1970. Page 3. Correspondence with David M. Blum, October 2013. On file with cooksinfo.com. Blum worked with Dion at the Dione Lucas Gourmet Center from 1967 – 1971. Heatter, Maida. Cakes. Andrews McMeel Publishing, 1997 page 74. “Dione Lucas, 62, internationally known gourmet cook… died Saturday of pneumonia in London… She had resided at 200 East 51st Street, New York City.” — Bennington Banner. Dione Lucas, culinary artisan, dies in London of pneumonia. Monday, 20 December 1971. Page 21. Stanley, Autumn. Mothers and daughters of invention. Rutgers University Press. 1995. Page 56. Angelica, Gibbs. With Palette Knife and Skillet. The New Yorker. 28 May 1949. Page 34. Bennington’s Social Activities column. Kitchen Display To Be Featured By French Cook. Bennington, Vermont: The Bennington Evening Banner. 4 June 1955. Page 6. Burros, Marian. In Boston, Pilgrims’ Food (With a Touch of Paris). New York: New York Times. 27 January 1988. Fussell, Betty and Mary Frances Kenndy Fisher. Masters of American Cookery. University of Nebraska Press, 2005. Page 57. Grodinsky, Peggy. Food for thought: New book illuminates lives of those who influenced the way we eat. Houston, Texas: The Houston Chronicle. 21 March 2006. Lowry, Cynthia. Cooking Of Gourmet Dishes For Video Requires Expert. Fresno, California: The Fresno Bee Republican. 26 December 1948. Page 8. Paddleford, Clementine. “Cook Makes an Art of an Omelet.” New York Herald Tribune. 11 Feb 1950. Rose, Ellen Cronan. The Brasserie: Gay, Casual And, Oh, Those Quenelles! Bennington, Vermont: Bennington Banner. 11 July 1970. Sharp, Dennis and Sally Rendel. Connell Ward & Lucas: Modern movement architects in England 1929-1939. Time Magazine. Cooking for the Camera. 30 May 1955. Time Magazine. Everyone’s in the kitchen. 25 November 1966. Wendler, Adelaide. International Culinary Expert at Home in Improvised Kitchen. High Point, North Carolina: The High Point Enteprise. 10 November 1960. Page 13.